If you have mastered mitering standard, square, 90° corners, then you already have the skills to do an odd-ball corner because it's done exactly the same way. Aren't you lucky? :-) The above picture is a six-sided placemat where every corner has been nicely (more or less) mitered. 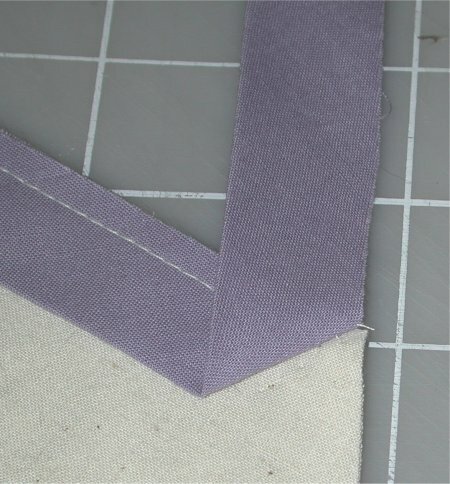 You can use either straight-of-grain or bias binding to finish this edge, it really doesn't matter. 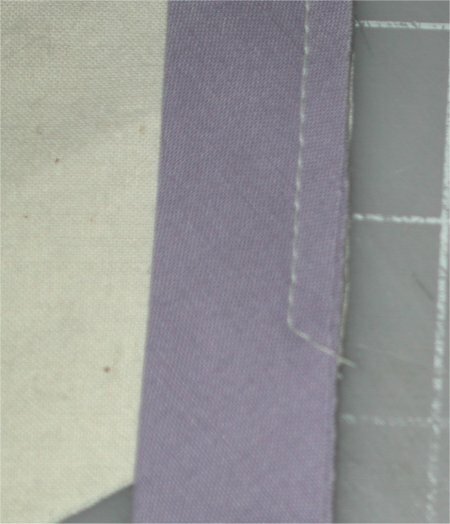 In the following examples, I am using a muslin base fabric and lavendar binding to show the sequence of steps. I am also using double-fold bias binding, just because that's what I had handy. 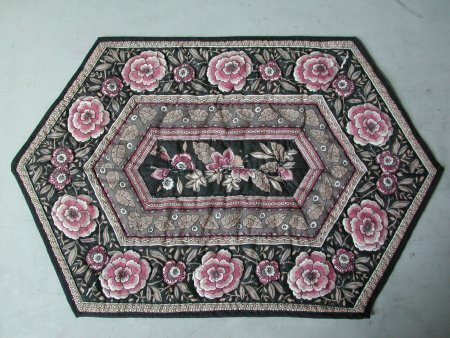 Do steps 1 - 5 for EACH corner of your quilted item. Steps 6 - 10 are done AFTER the binding has been intially stitched to each corner. Please be aware that this example shows only one corner being stitched. 1. 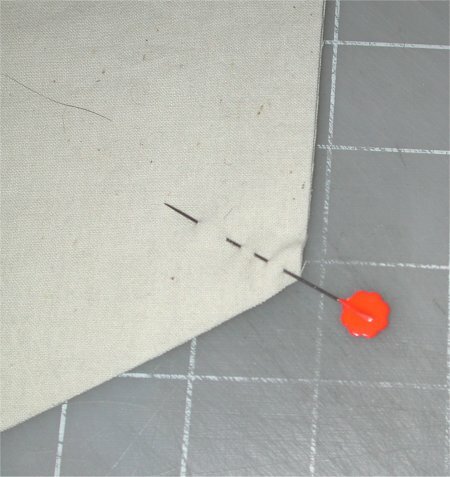 Here is a corner where the angle is marked with a pin. 2. The binding is put on the base fabric, right sides together, raw edges even. Stitch right up to where the needle hits the pin that marks where the angle is. 3. 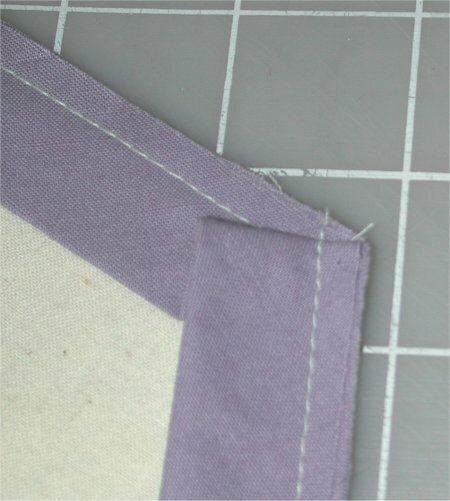 At the point where the angle hits the seam allowance, I usually stitch off the fabric, following the angle. 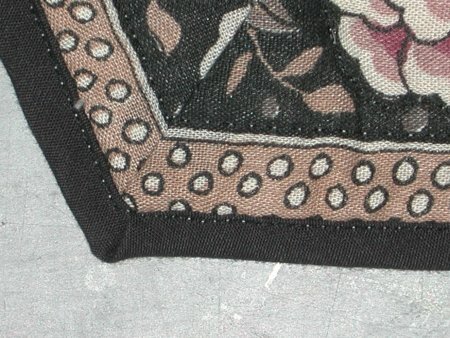 This stitches down the fabric on the angle on this side of the base fabric. If you don't care to do this, just back-stitch to secure the end of the stitching. Either way is fine and in fact, I've done it both ways, depending on how I'm feeling at the time. 4. 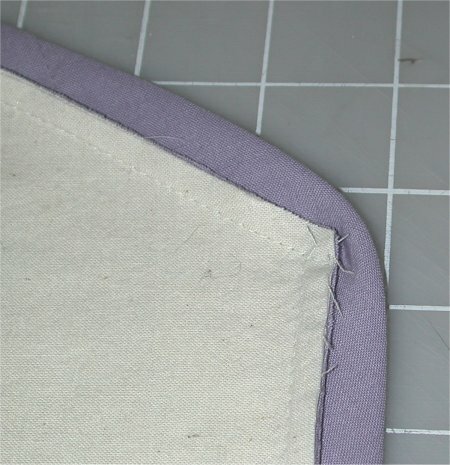 The base fabric has been turned to the left so that the seam allowance just stitched is at the top of the photo. The new side to be stitched is aligned vertically. Just as when you miter a regular square corner, flip the binding up and away from you, so that the raw edge of the binding forms a straight line with the edge of the new side to be stitched. 5. Flip the binding back towards you. The fold of the binding (the top end) should be at the point of the angle. (If this was a regular square corner, the fold of the binding would be even with the raw edge of the previous side .. in this case we do NOT want to do that.) Stitch this side of the binding down. 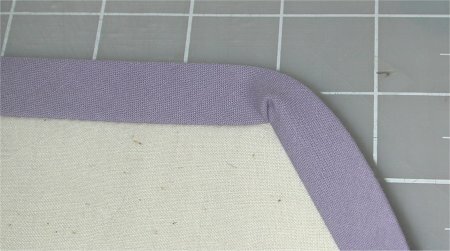 You don't need to back-stitch at the beginning of the seam. Do the above steps for EVERY corner. At this point, the binding should be stitched to every corner in your quilted item. Steps 6 - 10 will complete the binding. 6. Fold the binding towards the seam allowance all the way around the quilted item. The corner will have a small pucker in it .. that's OK. It will go away just as soon as you turn the binding to the other side of the quilted item. 7. Here's the reverse side of step 6, showing the small pucker on the other side. This is OK at this point. 8. Fold the binding to the other side of the quilted item. Stitch close to the folded edge. The pin in the photo marks where the angle point is. 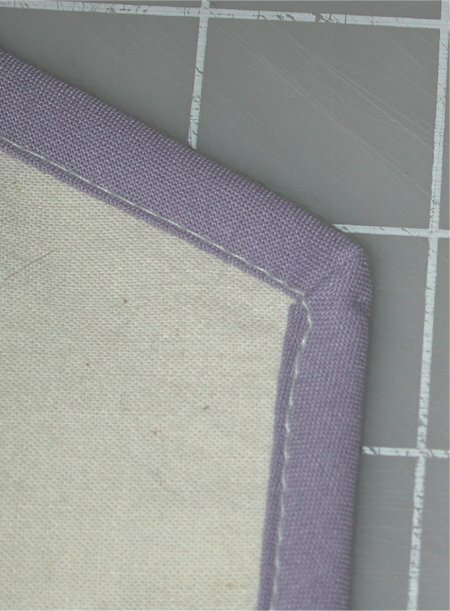 Notice that only the edge being stitched is folded over .. the next binding segment has NOT been folded over. 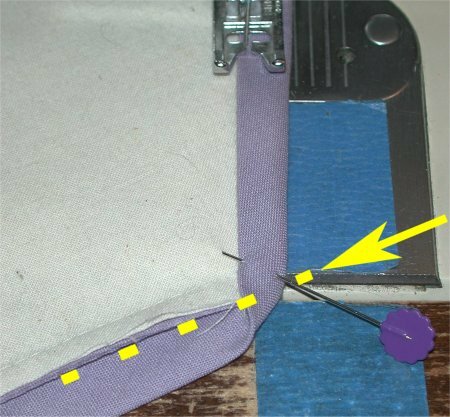 Stop stitching about an inch or so prior to the corner so you can proceed with step 9 but don't remove the quilted item from the needle. I just keep the sewing machine needle in the "needle down" position to secure it while I'm doing the next step. 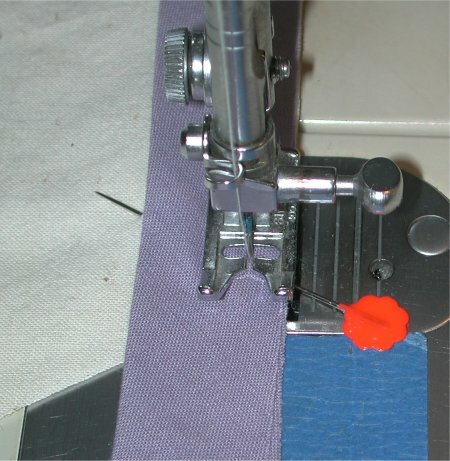 The yellow arrow shows the line (even with the seam allowance) where you are going to fold the next binding segment over. 9. Fold the next binding segment over on the yellow line as shown in step 8. The miter should form neatly and automatically. I've stuck a pin in the binding to hold it in place. Now continue stitching the binding around the corner. 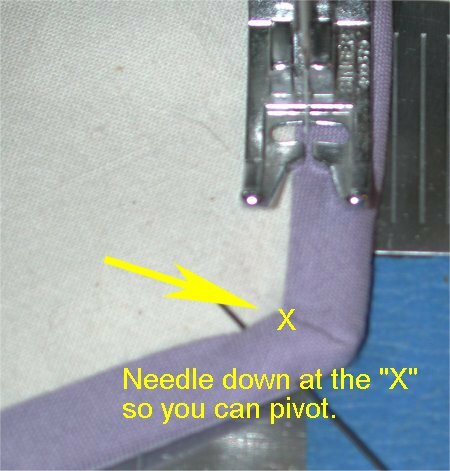 At the point where the needle hits the newly folded corner, you will want to keep the needle in the down position, so you can pivot the quilted item around. Well, mostly nicely. Not perfect, but ya know? Life is just too doggone short to worry about if every single miter is exactly perfect. You're going to launder these placemats, right? Well, once they are laundered, those miters ... even the not so perfect ones .. are going to look pretty nifty. So, don't worry about it. Feedback, comments, etc can be sent to Shelley Rodgers at pirate@value.net.